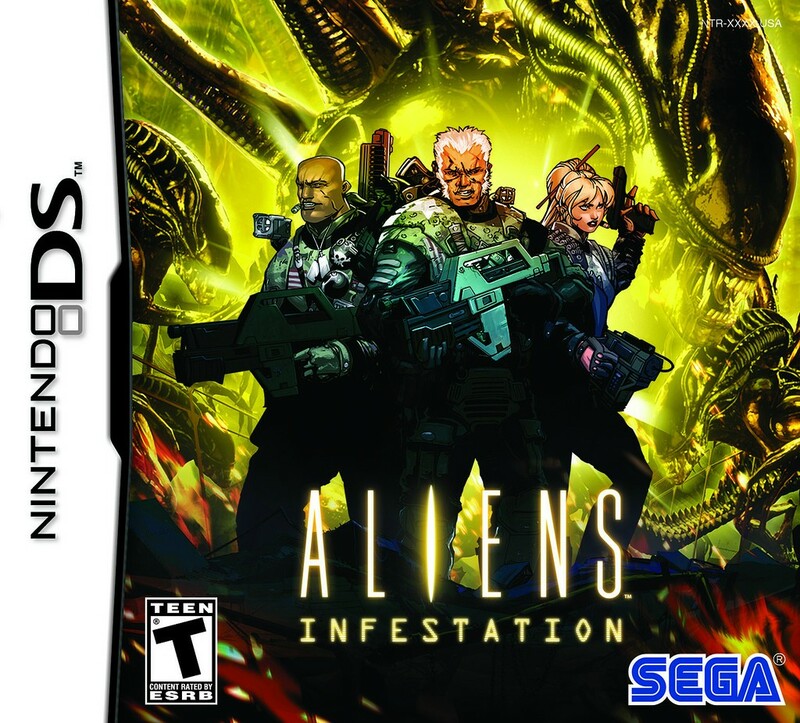 Actually, Aliens: Infestation will be my second-to-last must-buy DS game should Professor Layton and the Last Specter hit the streets after Sept. 30 (the former game's release date). 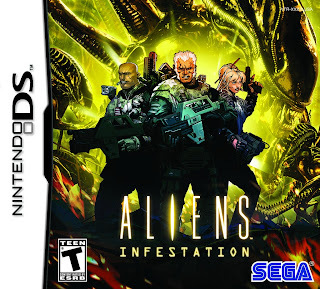 The only aspect of Aliens: Infestation that I'm not completely sold on at this point is its cover art (above). I wouldn't say it's bad, but I wouldn't say it's menacing, either--and menacing is exactly what I expect from anything and everything related to this classic franchise. Basically, the combination of all these factors makes this a game I'm definitely interested in. The first two Alien movies are definitely some of my favorites, as well! I'm hoping it can meet and possibly exceed expectations of ours, but we'll just have to overlook the cover art, yeah. I'm not too fond of it either... it's not menacing enough, like you said, nor is it really eye-catching or particularly artistic. Oh well, can't win 'em all! I'm completely willing to overlook the underwhelming cover art if the final products is as awesome as it currently looks and sounds, Kamiwoo. Thankfully, it's being made by the folks at WayForward, and they definitely know how to make good 2D games :) Still, fingers crossed! They'd do better with a black box with the simple Aliens logo on it...maybe a menacing shadow or detail that reminds us of the queen. I had no interest in this at all, but then you said two of my favorite things: 16 bit and Metroidvania. Now it's on MY list, too. Yeah, the queen has to be in everything related to Aliens, doesn't it? Maybe that's why they avoided it when creating this cover art, to tell you the truth. As for the game looking 16-bit and playing like a Metroidvania title: Did you watch some of the video I linked you to, Justin? It proves that perfectly, IMO. In fact, it makes the game look like a SNES Metroidvania game to me, which is *always* a good thing! Not yet. I ran out of time this morning, but I'm about to. I wish the video was larger, showed more detail, but even in its current state it makes the game look pretty cool, IMO. The servers at that site have been down, so I haven't been able to see the video yet. Got it. Watching it now.